U2 just wouldn't be the same without Adam Clayton's powerful bass playing. His impeccable groove and expansive tone form the sonic foundation of one of the biggest bands in the history of rock music. This is a limited edition Precision Bass from Fender USA, limited to only 100 pieces - in a Precision Bass configuration with an awesome Purple Sparkle finish and matching headstock! Throughout the entire phenomenal history of the band, the groundbreaking music of U2 has been underpinned by the gracefully muscular bass work of Adam Clayton. His impeccable groove and expansive tone form the sonic foundation of one of the biggest bands in the history of rock music, never more powerfully than today. 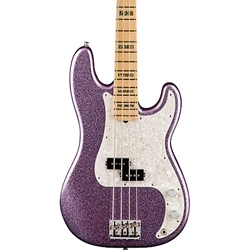 Fender's Adam Clayton Precision Bass puts his rock-solid sound and style in your hands, with elegant appointments and elemental tone, including two potent Fender Custom Shop pickups and a limited edition Purple Sparkle gloss finish with matching headstock.